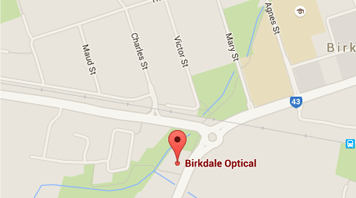 Optometrist Martin McKenna has practiced in the Redlands since 1994 and established Birkdale Optical in 2006. We have built a strong reputation for friendly, reliable service and a commitment to finding the right solutions for people's visual needs. Our customers are given thorough eye examinations in a friendly, relaxed atmosphere taking the time to listen to their problems and answer their questions. We provide all the benefits of independent practice, along with the benefit of membership of a national network for the supply of quality frames and lenses. Our range includes beautiful Airlight frames, designed and made in France in addition to frames from other European brands such as Rodenstock and L'Amy. Easy access for wheelchairs via lift or ramp.